Never in my life did I imagine that I would become a military spouse. When I was younger, I thought certain people were made for things like this and I was certainly not one of them. My husband joined the U.S. Army Reserves as a chaplain in January of 2018 after 12 years of marriage. We were in a place I don’t think either of us expected, but God in His graciousness led us to it and I suddenly became something I never planned to be: an Army wife. You can’t plan it. As much as you’d like to, you just can’t. You can try, but I sure haven’t had very good luck at it. We plan because planning makes us feel safe, as the uncertainty can often be frightening. I used to do a lot of traveling for an old job of mine. I was just out of college at the time—young and a bit unsure of life on the road. I always had a fear of walking into a hotel room that was already occupied by someone. So instead of walking right into a room, I would push the door open and take a quick peek to survey the surrounding area before going any further. It sounds more like I was entering a crime scene than a hotel room. Oh, what the imagination can do. However, my imagination proved to be true one evening as I lugged all my bags with me (I’ve always been a one-trip girl) up to my room a bit weighed down. But I still found the strength to push that door open and the first thing I saw was a bright light. Then I heard a man yelling profanities at me. I looked in the direction of the voice, and there was a man working on his laptop while sitting on the toilet. Doing his job times two. That door I had pushed opened seemed to move in slow motion as it shut in front of me. I took a deep breath after the door closed. My hotel fear just happened. I went down to the hotel desk to tell them that someone else was in that room, and he wasn’t very happy to have me as a visitor. The desk staff apologized profusely and gave me a suite for my trouble. Sometimes our fears come true; things in life we never expected can and do happen. The fear of deployment, loss of friendships, an impending move, starting all over again, death of a loved one, our child adjusting, finding purpose, a sick child, etc. What will we do with those times? This past summer my husband left for three months to complete CHBOLC. 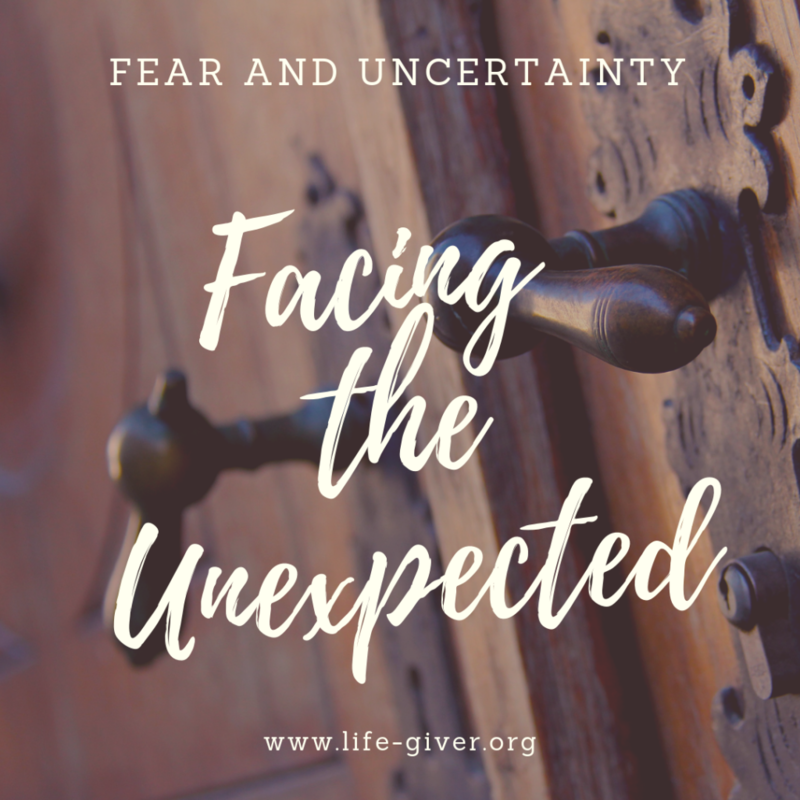 I was scared and I can remember the waves of grief that would come over me as I thought about living life without my best friend next to me, becoming a “single” mom to a special needs child, and balancing all of this with full-time employment. It was, in a word, overwhelming. Jesus gave His closest buddies a pep talk, some encouraging words for their impending grief. Really, it was some very good news in the face of the difficult news that after three years of walking closely with and teaching His disciples He would leave them to go back to His Father. Life does not always hand us a hotel upgrade for our troubles like it did for me on that fall afternoon in the New Jersey Best Western. However, Jesus says we can have peace because He has overcome the troubles of this life. Troubles are inevitable. Yet, whatever pain or grief our hearts will experience in this life, Jesus offers us Himself, His power and presence, to overcome them. Beloved, take this joyfully. Fear doesn’t have to control us. You and I will make it because Jesus is enough. We will walk through difficult seasons because Jesus is enough. We will face our fears because Jesus is enough. I could not be more excited to share my good friend, Brittany Boccher with you. She was the 2017 AFI Military Spouse of the Year and has been traveling the country investing in military spouse by helping them define their identity and purpose. Originally, Brittany defined her purpose by advocating for special needs families as she has a son with multiple medical issues. However, she soon found that a bigger issue is plaguing our community- a lack of identity. Brittany continues to advocate for EFMP families, but her passion for helping spouses reclaim who they are and find new purpose has resulted in her partnering with the USO to create a workshop and workbook titled Discovering Your Spark. Safety and security is more important than ever. In a time where foreign adversaries are actively targeting and using American social media accounts, we need all the help we can get to keep our family and mission safe. 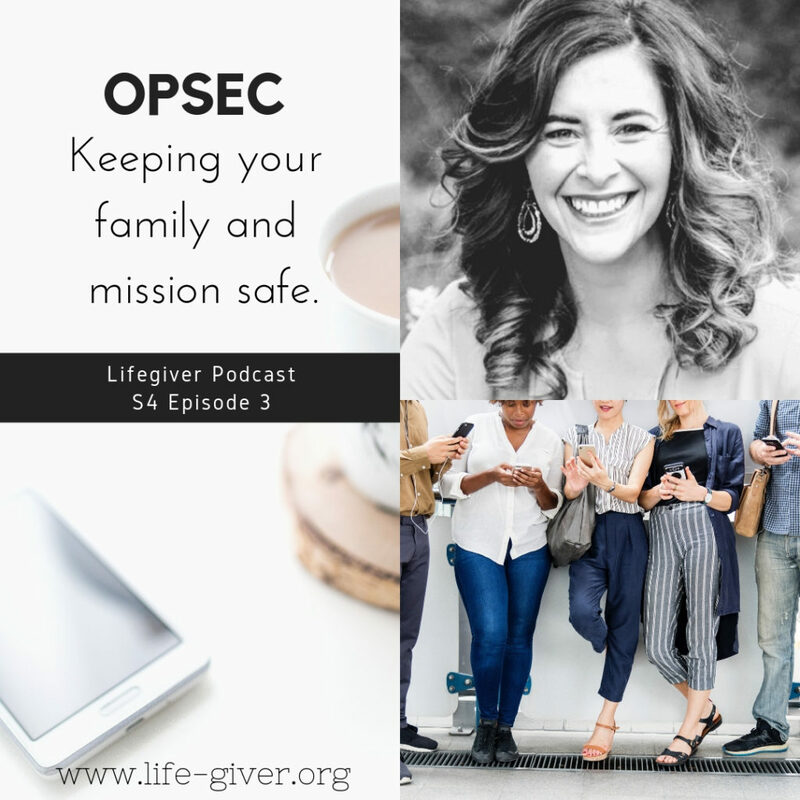 In this episode, I bring in my good friend, OPSEC Alex (Alexandra Panaretos) to give us practical advice and tips on personal and operation security. I met Alex in 2015 at the AFI Military Spouse of the Year Awards where we discovered many military spouses, now in the public eye, were targeted by adversaries and being investigated by the FBI. This hit home for so many of us and we realized it was time to take our personal information, including information on our family, seriously. Alex, a former military spouse herself, has made it her mission to educate military families and businesses on digital and personal safety. This episode may be tough to hear, but it is absolutely imperative to share with your friends and family, as well as the military families you serve with. This episode can also be WATCHED on the Youtube link below. What should I do if I think my kid’s device has been hacked? Being a military family is tough. There are not only significant challenges, but endless resources out there to help you. How do you know who to go to? Who is standing up for the needs we have? Is anyone in the upper echelons paying attention? Today, I have a beautiful interview with Patty Barron, the Family Readiness Director of AUSA. She is our mother hen in the military spouse world. She has been to almost every event I have ever been to- listening to what we are saying and working hard to find answers. In this interview, Patty talks about the AUSA Annual Conference and how you can participate as a family as well as what the AUSA Family Readiness side of things has for you. Family Readiness Spouse Forums: Webinars on topics that families have requested help on that you can participate in live or watch them at your convenience. Patty wants to hear from you! What are your needs an concerns as a military family? She is willing to pull together resources and experts to answer the big questions that you have. How would you most like to receive answers to your questions? Webinars? Podcasts? Emails? Our culture tends to struggle, isolated, in their homes not realizing there are answers and help right in front of them. AUSA is one you definitely need to know about and get involved with! It is our turn to move again. If you haven’t heard me talk about it, #TeamWeathers is on the road again to our next location. This one will only be for a year, our shortest yet, while Matt is in school and takes a much needed break to replenish. We are making our rounds visiting and living with family as we wait for housing on post to open up. I am extremely grateful for their support for us as we have moved in only to leave stuff behind for us to get later. Although it is wonderful to see familiar faces, it doesn’t quite fill the hole of having a home or the anticipation of where we will be. Thankfully, we visited post to see the housing, so I have been envisioning where I will put furniture and settling in my mind. Of course, I have seen this not go well before because the mind has a way of distorting the actual size of what I remember. The boys are handling it very well. The newness of an adventure has a way of easing the transition and we have made sure to create opportunities to “circle the wagons” between the four of us by planning fun events, checking in at night with how we are doing, and protecting our time as needed. As we drove through the suburbs on our way back to our temporary housing last night, I watched so many big houses pass by my window. I wondered what it must be like for a family to choose a house and stay there for 20 years. I wondered what their life is like, the friends they see all the time, and the church they invest in that becomes a second home. Then I wonder if they know I exist. If they ever think about the families that give so much to give them the freedom to make the decisions they do. I don’t want pity at all, some have even said to me how they long for the adventures I get to have- starting over in a new place. The grass is always greener until you have to maintain it, I’m reminded. But what I believe is really going on inside me is a moment of loneliness that exists in the adventure more than I need their attention. It’s a need to feel understood in the midst of the chaos of change. As we all climbed into bed together last night for an end of day snuggle, Matt prayed over all of us. With the boys in the middle, Matt and I reached our arms across them and held hands, closing them into the circle that was once just the two of us. “This is home”, he prayed- thanking God for giving us each other as a home. Until these little men leave to make their own family, we will always find home base between us. I find so much comfort in that this morning. I think about the many different groups of spouses I have talked to since winning the MSOY15 award. National Guard Spouses who are tucked into the suburbs trying to fit in who don’t have other military families around them. Special operation spouses who never get to have a “normal” routine with their service member as they are whisked away for missions they can’t talk about. They are all asking the same question I am. I don’t think it comes from a place of entitlement. There are many jobs out there that involve a spouse traveling, being gone, being in harms way, and relocating. Some of them are taken by service members when they retire because it is familiar. Like others including emergency responders, the nature of what military families do rest on a purpose to serve their country, to make sure we have the freedoms we were given- and spouses and military kids join in to serve the country too- and I believe we love it. That is why military families huddle up. Our desire is not to push everyone else out or act entitled, we just need to rest in the familiar. We need to mention in passing the stress of the lifestyle and hear someone say, “I know”. It often doesn’t take more than that. That is why I am excited about the upcoming launch of the Lifegiver Podcast. Hearing other people’s stories can be a powerful antidote to our weariness. It can be a reminder that we are not alone and I promise you- hearing a shout out from someone else saying “thank you” can mean the world. I understand that this is one niche of so many. There are plenty of amazing people to thank in this world and I hope we are finding them and thanking them on a daily basis. Gratitude can change everyone involved. I hope you will join me. I hope, whether you are military or not, that you will consider recording a thank you or an encouraging message to a military spouse. You can quickly record it on your device and email it to corie@corieweathers.com to be included on the Lifegiver Podcast. it can make a huge difference to someone who is feeling alone in their new location, fighting to keep their marriage strong, or trying to find purpose in a new city. I am here to share the megaphone I have been given, and I hope you will join me. 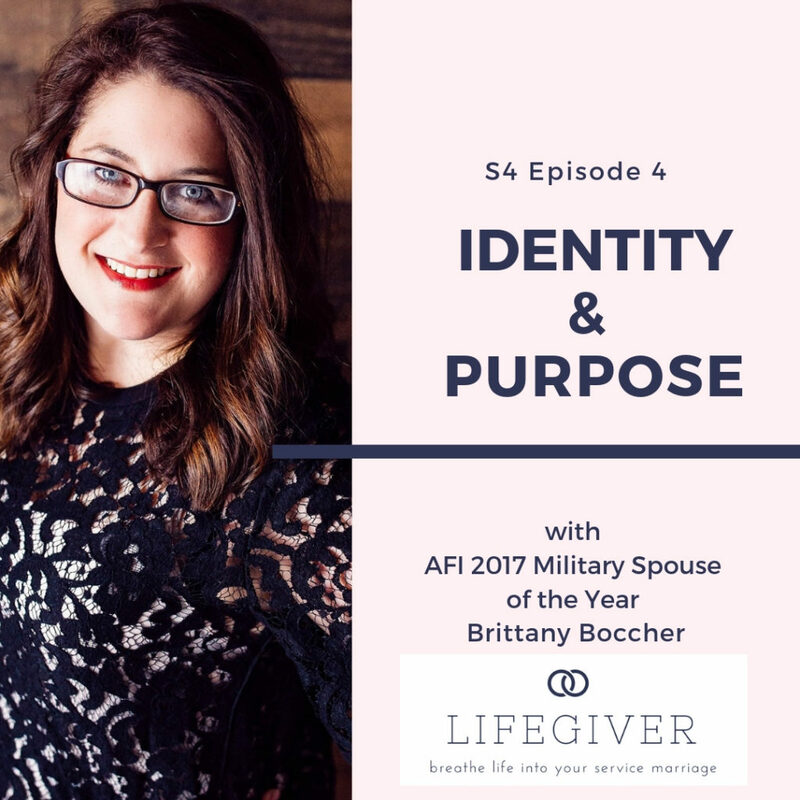 Listen now to the first Episode of Lifegiver Military Spouse Podcast, available on iTunes. I love being a military spouse. It provides an opportunity to travel, be part of something bigger than myself, and serve along side my soldier. Balancing out the bright moments are the darker difficult days of relocating, adjusting, and times of separation. It is a bitter sweet relationship that promises to stretch me out of my comfort zone and make me better, even if I go kicking and fighting. I find that I can count on that now. Like clockwork, although I promised myself that I would not “settle in”, I find that I accidentally did and PCS orders remind me once again that I was never supposed to stay. I realize I can’t help myself from nesting- buying those curtains that may only work in this home or constructing a garden that clearly cannot be uprooted. It is in my nature as a “lifegiver” to create life wherever I am. I’ve accepted that about myself. I love to plant myself, root where I am, and allow the season to hopefully create a harvest with me or out of me because I need it like a I need air. I need community, others to rely on and them to rely on me. I need my children to experience that home is wherever we are and if that means I buy new curtains that fit in every new home, then so be it. I need an opportunity to grow and be challenged with a project that forces me to “find a solution to the problem/need” like a life sized Calculus problem waiting for the student to raise their hands with a triumphant sigh. And yet here I am again, realizing that I planted myself in Augusta, Ga- loving my current set of curtains and sitting on my new-er sofa looking at orders to leave. Augusta provided a chance for me to use my counseling license and practice. I welcomed new clients with open arms and shared the vulnerable journey of life along side so many. Augusta needed a Christian Counselor for teen girls, and I became it. Like a flock of birds migrating, they all came to me, brought by frazzled parents who were looking for hope and answers. This became my life-sized Calculus problem- how to help a large group of teen girls feel less alone- and so I sweated through the problem and found the solution by starting an outpatient program. I decided to introduce my teen clients to each other through a therapy group and it became theirs. Theirs to own, create, protect, and use to find acceptance, test new social skills, and say the things to each other that they also needed to hear. I have seen girls overcome social anxiety through talking in group, find courage to do the right thing, find normalcy in the pressures of school and culture, and discover that being “good” still means something in this world. Creating a safe and inviting space was no easy task. My soldier championed me by making book shelves, hanging things on the walls, even delivering our own TV from our home to make group happen. It has been a joy to sacrifice for this project. I have learned so much from these girls, girls that still struggle to find how they can make a difference in the world around them. And as I look at our orders in front of me to leave, I realize that none of this was ever mine to keep. It was never mine to begin with, it was something I was asked to make and take care of for a season. And after I go, it will evolve into whatever it needs to become for those after me. There will me more girls, more issues, and more needs to fill. It will become someone else’s life-size Calculus problem and they will see something that I couldn’t see. I realize now that we aren’t supposed to do any of it on our own or we will find ourselves tempted to be the god of our surroundings. And so I am grateful. Grateful that I planted here and gave it my all. I know now that I wither without it and I don’t regret any of it. I am grateful that I got to be part of something that made a difference, even if for one family. Grateful that I get to hand all of this off to someone else- whether it means it thrives or finds the end of its life cycle. Grateful that I spent this season embracing the stretch of trying something new and saw it succeed, grateful that I can raise my hands in the air in triumph and sigh- it was worth it. I hate saying goodbye- to my clients who have opened up their hearts and trusted me, to my employers who gave a military spouse a chance knowing she would leave, and to friends that I would have invited into my imaginary neighborhood of collected life-friends we call family. But its time, and we are called to go. I have grown to appreciate the warm wash of future uncertainty even though it still makes me nervous. This will be my fourth location and although I know how to direct the packers, can expect the dreaded 6 month mark of melancholy that I will feel, and can embrace the opportunity to reinvent myself, the anxiety of change still looms. What will my kitchen look like? Will we find a church home? Will the spouses like me? Will people want to invest in us when we won’t be around for long? What in the world will I find to do there? I don’t think that ever goes away, but at least I know this- I will plant myself. I will enjoy the warmth of the sun shining there and hold its memory for the days when the clouds seem to linger too long. I will take on a new season of growth and let it stretch me in a new way because its harvest reveals character. In the meantime, I will balance this decisive courage with a little bit of retail therapy shopping for curtains and possibly consider dying my hair some shade of purple.